KVS 4339 Vacancy 2015 / KVS Recruitment 2015 - There is latest news for all of those candidates who are waiting for Online Vacancies of Kendriya Vidyalaya Sangathan (KVS) TGT/PGT, UDC/LDC on KVS Official Website www.kvsangathan.nic.in . KVS has released notification for Recruitment 2015-16 for total 4339 posts of Primary Teacher, TGT, PGT, Officers. 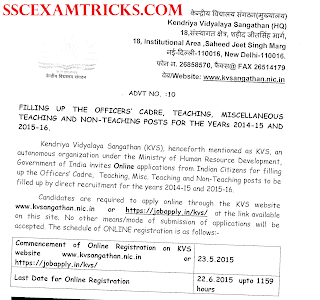 KVS had invited online application for Teaching and Non Teaching Recruitment 2015 which will be available on 23rd May 2015 at https-//jobapply.in/kvs/. The Last date to apply online for 4339 teaching and non-teaching posts is 22nd June 2015 up to 11:59 PM on official website. KVS Recruitment 2015 Eligible criteria for suitable candidates are set different for differently abled candidates. The eligibility criteria for KVS 4339 Vacancy 2015 are discussed in the summary table provided below for TGT PGT UDC LDC and other posts. The payment of application form will start from 23rd May 2015. The application fee for Vice Principal & Finance officer posts is Rs. 1250/- and for other teaching & non-teaching posts is Rs. 750/-. Candidate must not that for KVS Recruitment 2015 Online Payment through Credit/ Debit Card (Master or Visa approved), Indian Bank Servie Charge will be Rs. 30/- (Thirty only) additional to the fees. The KVS Recruitment 2015 age relaxation will be as per government norms. The Final Selection of the candidate will be based on the performance in Written Examination and Interview of the eligible candidates. · For Trained Graduate Teacher – passed Senior Secondary School certificate with 50% marks/ Intermediate with 50% marks & should pass in Central Teacher Eligibility Test (CTET) conducted by CBSE with Competence to teach through Hindi & English for Primary Teacher. · For Online Payment through Credit/ Debit Card (Master or Visa approved), Indian Bank Servie Charge - Rs. 30/- (Thirty only) additional to the fees. Based on Merit List prepared from performance in written test, Performance test, skill test & interview. It is advised to the candidates that to know more about KVS 4339 Vacancy 2015 posts details, age & relaxation in age, qualification for teaching, non-teaching & officers posts and their pay scale, grade etc. Download and Read KVS 4339 Vacancy 2015 Advertisement in PDF provided below for purpose of better understanding of these vacancies by the candidates. Download KVS 4339 Vacancy 2015 Advertisement PDF from the direct link provided in the end of the posts ALL Notification/Advertisements. Read all the instructions and GUIDELINES provided before apply online application form any for posts of KVS Teaching, KVS Non-Teaching, KVS Officers vacancies 2015-16. For online Registration (First Stage), Interested Candidates must click on direct link for Apply Online for Registration or Click on the official website https-//jobapply.in/kvs/. Read carefully and Fill KVS Vacancies ONLINE Application form (Specially don’t leave RED star mark columns) by selecting your interest applied posts first provided on the top of the page. Attach recent coloured passport size photograph and signature of the candidates in prescribed format mentioned in the advertisement of KVS. Candidates don’t hesitate to provide Mobile No. in Column provided for sending password, admit cards and other relevant information to the applied candidates by KVS Organization. Click on Registration of Step I submit button provided in the end of the page and move to the second stage which is payment of application fee for the applied posts. Note download Registration number and password which will appear on the computer screen. Candidate to make payment of KVS Vacancies 2015 by online through Debit Card, Credit Card, ATM, Net Banking or Offline Payment. Select your mode of payment and click on the next button. Candidates must view their submitted online KVS Application for Teaching and Non-Teaching Posts. Candidates must enter Registration ID and Password provided, then press login button to view your application status. It is advised to the candidates that they must have Duplicate Registration Slip & Application form.